If I had to choose one bread, and one bread only to make when inviting friends and family for a vegan breakfast or brunch it would be English muffins. It’s just something with a newly toasted English muffin that is special. It feels luxurious, the way the toppings melts into the warm bread. I’m getting ahead of myself here (and also very hungry). In this recipe, I will go through how I make vegan English muffins from scratch. It’s easy and you’re English muffins baking skills will be up and running in no time. I’m going to give you the most frustrating answer you can get to a question of this kind; it depends. If you get store-bought English muffins they might be vegan, check the ingredients list. A lot of English muffin recipes on the internet and in cookbooks that I have seen make use of milk, butter and lard. I have also seen recipes that use eggs. Of course, when you make vegan bread none of the above mention ingredients is an option, so what to use instead? Non-dairy and vegan butter alternatives are quite common and easy to find. Most types of margarine are also dairy-free but have a look here before you buy since some of them contain milk or milk powder. Just replace the milk with any plant-based milk with a ratio of 1:1. Replace the lard with your non-dairy or vegan butter option from earlier. It is pretty much interchangeable. I don’t really see the purpose of using eggs when you make English muffins so make egg free English muffins by simply removing it. Now, to make it even easier for you. Just continue to read to get my take on a vegan English muffin recipe. Again, it’s not difficult and you will most surely bake it again and again. 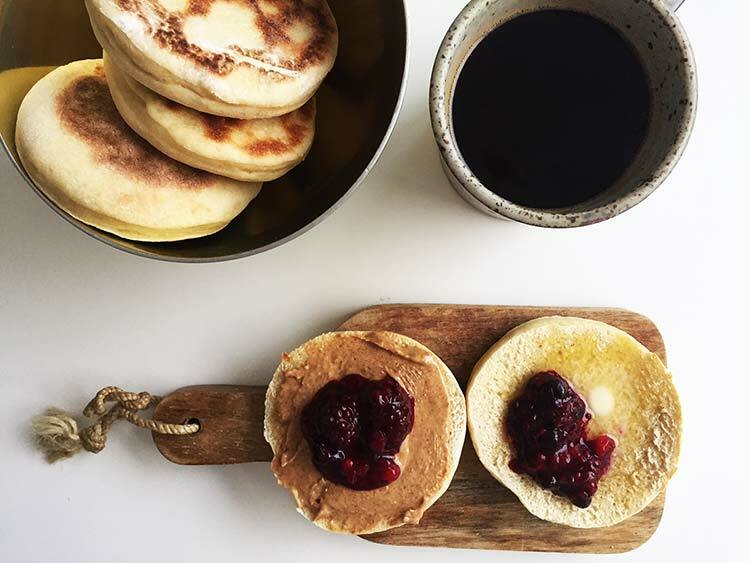 A great thing about English muffins is that you can make them both sweet and savoury, depending on what toppings you choose. You can pretty much put whatever you want on them. I will list some of my personal favourites here, but I really encourage you to try different things out here. If you find something that you like, please let me know in the comments, because I want to try that too! The list can go on forever, but now, let’s get cooking (or baking in this case)! 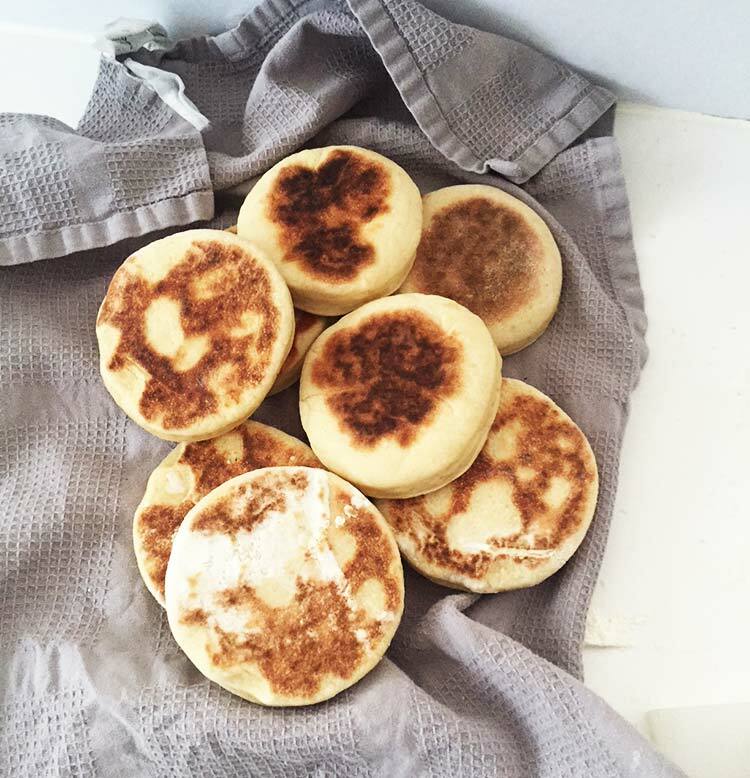 The unique thing about English muffins is the process of how you bake them. Traditionally when you make yeast bread you let the dough rise and then form it and pop it in the oven. 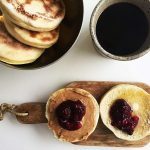 In this recipe (and all recipes for English muffins) you will use a skillet or frying pan and fry the bread. The first thing you’re going to do is to combine flour, yeast and salt in a large bowl. Next up add the non-dairy butter and pinch it into the flour mix until you have a crumbly flour mix. I find it easiest to use my hands when I do this. The colder the butter is the easier it will be for you to pinch it and create the crumble. Dry hands also help out a lot when you’re doing this. In a saucepan, mix plant milk (I used soy milk) sweetener (I used syrup) and heat in the stove until the mixture is warm, but not hot. You should feel that the mixture is warm but not want to instinctively pull your finger out). 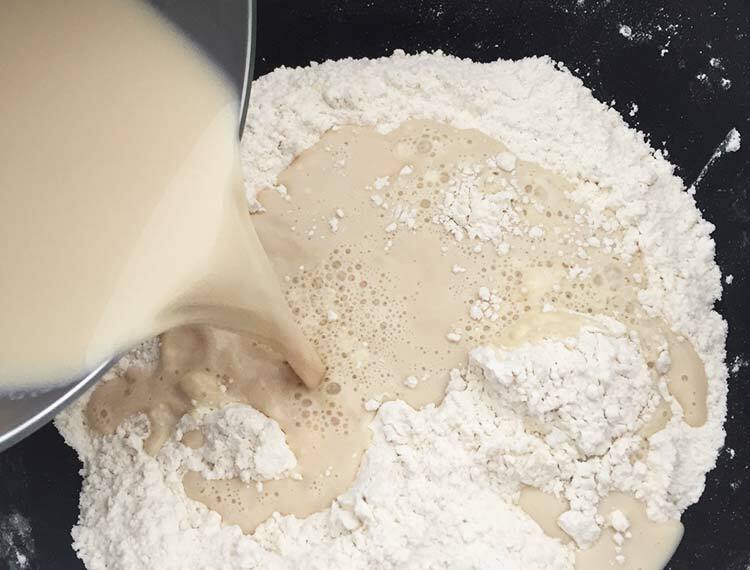 Pour in the hot plant milk to the flour mixture and use a steady ladle to mix it all together. When you have formed a dough it is time to get your hands in and knead. Continue to knead the dough for about 10 minutes. I feel that 10-15 minutes is the perfect amount to knead a dough if I do it by hand. The slight time difference depends on the consistency of the dough and what type of flour I use. When you are done kneading form the dough into a ball, cover with a kitchen towel and let the dough rise in a draft-free place for about an hour or until it has doubled in size. Depending on room temperature, the quality of the yeast and other things the time for rising might differ. Usually, 45 minutes to an hour is enough. Now it is time to cut out your English muffins. Bring out your rolling pin and roll the dough out until it is 2 cm (that’s about an inch) thick and start to cut out round circles. They should be about 10 cm (about 4 inches) across. If you don’t have dough puncher you can use a glass or a cup with a round opening. Cut out as many rounds as you can, then use the rolling pin on the left-over dough and punch out some more rounds until you have no dough left. I managed to get 10 English muffins out of my dough. Cover the muffins with a kitchen towel and let the muffins rise a second time for about 30 minutes. Bake time! Heat up a skillet over medium heat and add the muffins to the dry skillet and fry them for a couple of minutes on each side until they turn golden brown. Keep them in a kitchen towel until they have cooled off (if you don’t eat them right away). Once they have cooled, you can store them in an airtight bag for about 4 days. My best tip, however, is to freeze the ones that you don’t eat right away. They keep up in the freezer almost forever and you can bring them out once you need them. Since they are going to be toasted there it’s not necessary to thaw them, just put them in the toaster and go! Now that’s it! You can now add vegan English muffins to vegan recipes list. Well done! If you like this recipe, please tell me in the comments below that would make me so happy! As, always you find me on Facebook, Twitter, Instagram and Pinterest. 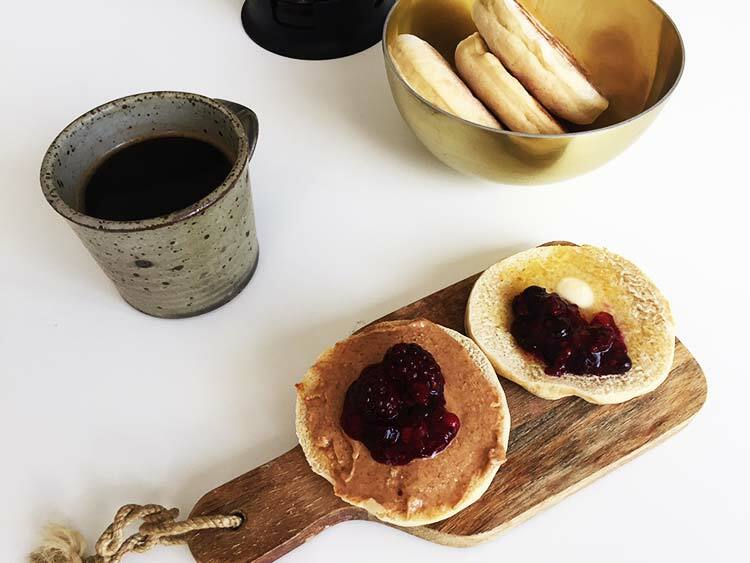 If you want to have a great vegan breakfast bread, these vegan English muffins will be perfect for you. They are easy to make and you can keep them in the freezer for as long as you like so they are great to prepare in advance. Mix flour, yeast and salt in a large bowl. Add the butter and pinch it so that you have a crumbly flour mix. Add the milk and syrup to a saucepan and heat over medium heat until warm but not hot. Pour the warm milk and syrup into the flour-mix and start to knead. Continue to knead for about 10 minutes until you have a firm dough. Cover and let rise for about an hour. Pour the dough out on a lightly floured surface and use a rolling pin to roll out the dough until it is about 2 cm (a little less than an inch) thick and punch out circles. Roll out the left-over dough and punch out more circles until you're out of dough. Cover the muffins and let rise again for about 45 minutes. 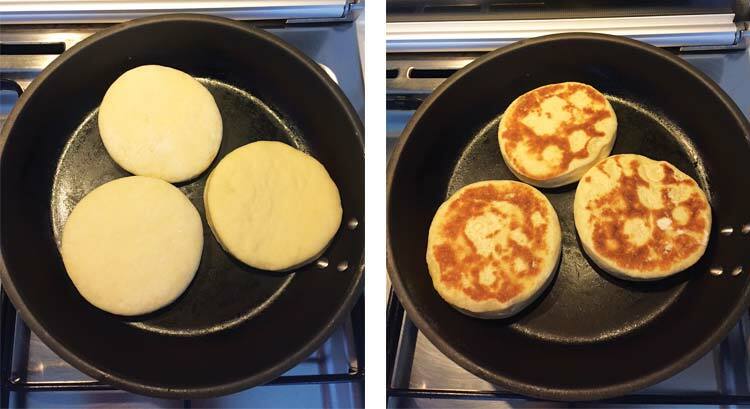 Heat up a dry skillet over medium heat and fry the English muffins a couple of minutes until they are golden brown. Flip them over and fry on the other side. These vegan English muffins are best served directly when baked or when toasted. The best way to store them is to freeze them and then just pop them in the toaster when you want to eat them.